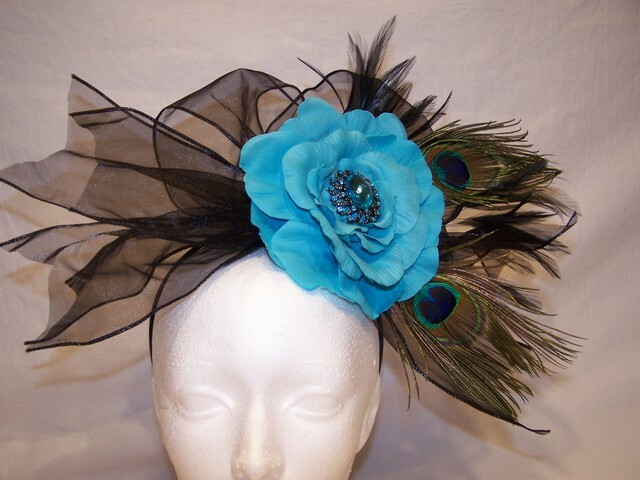 This fascinator was designed for a client who was attending a wedding in Wales and wanted something spectacular and over the top for her nephew’s wedding. This particular lady LOVES hats and was in no way, shape or form going to attend the wedding of the year with any old piece of millinery on her head. She wanted to make an entrance and so together we created this fanciful creation. 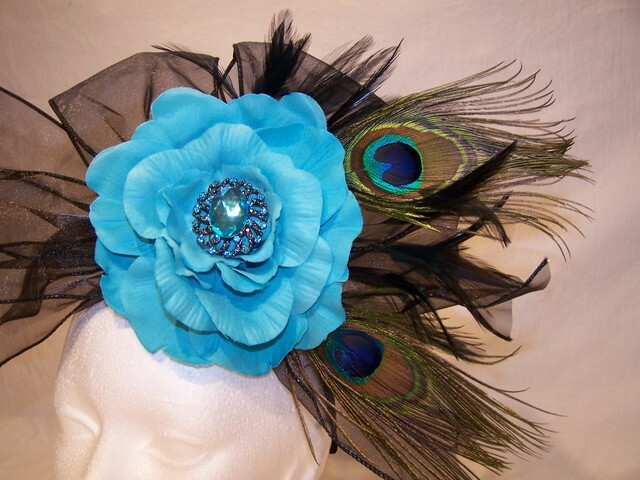 The teal blue flower was used to pick up the teal from the floral pattern in her dress and its jewelled center together with the peackcock feathers added glamour and sparkle. The wired black organza ribbon loops and tails added balance and further drama to the other side of the fascinator. She was thrilled and momentarily at a loss for words when she saw it. She tried it on and her face lit up as she gazed at her reflection in the mirror. This is the first of my designs to travel that far away and she was my first client to share my love of drama and “just go for it” mentality when it comes to expressing one’s self. I hope and look forward to working with her again on something equally fabulous. And, if I am lucky, more clients with her sense of fun and style will come my way! Earlier this past winter, I posted that I had submitted two of my pieces to two art magazines in the hopes that they would choose me and my artwork to publish. Well, they did! My hat titled “Love Letter” was chosen as a finalist for the Hot for Hats challenge and here is the article as it appears in the Summer 2012 issue of Belle Armoire. 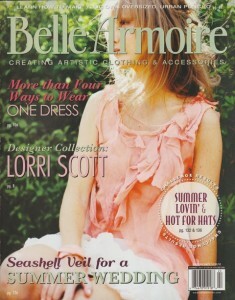 I received my copy of the magazine from them and have also now had the pleasure of seeing it on newstands! 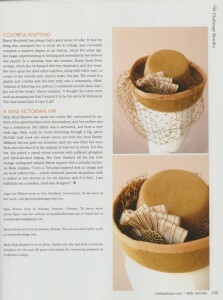 I have posted the magazine cover as well as pictures and text from the article for you to see and read. 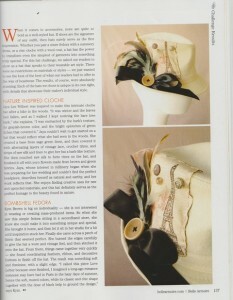 My hat is the cream coloured fedora with the Eiffel tower image and feathers. The related text is entitled “Bombshell Fedora”. My name, place of residence and contact information was also provided in the article. 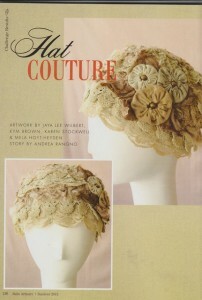 I was also contacted this week by one of their sister publications, Altered Couture and advised that they would like to publish the other of my submissions for their November 2012 issue. This one is the upcycled slip dress that I mentioned in my first posting about all this. I will be sure to post that article and its accompanying photos once it is printed and published. I am so honoured and encouraged by all this. I love and believe in what I do but it is still a huge confidence booster to be validated by the clothing art world! What’s a Party Without a New Dress?! 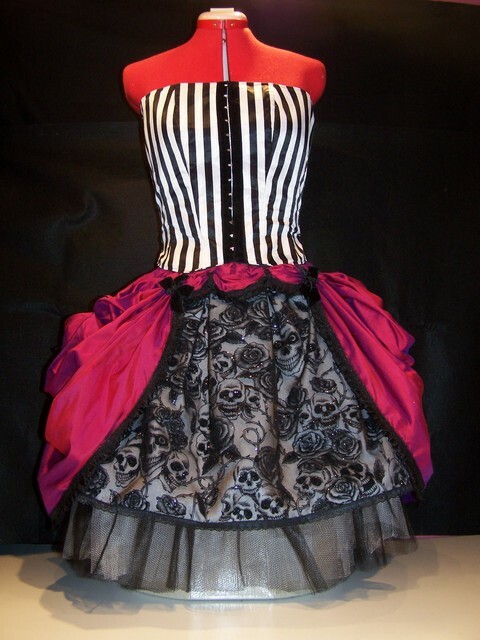 This dress was created by me to be worn to the 10th anniversary party for my church, Capital City Bikers Church in Ottawa. I felt this milestone of Biker’s Church demanded something special and fun. Regardless of whether anyone else was dressing up, it was a party and to me parties of that kind of importance could mean only one thing…… Party Dress! 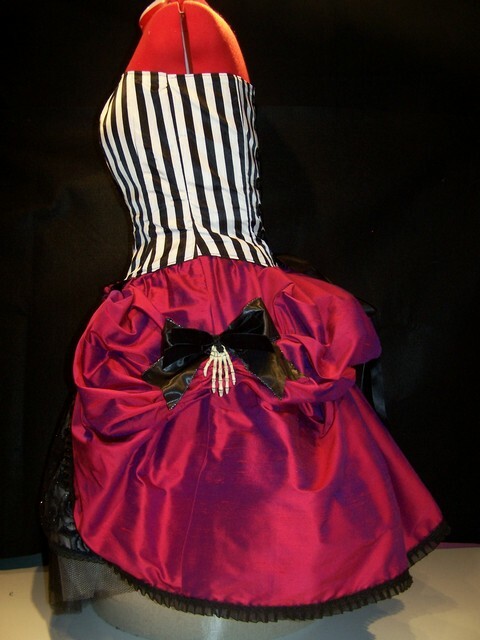 I was inspired by Tim Burton’s use of black and white, Betsey Johnson’s infamous party dresses as well as an amazing book from designer Mary Adams called The Party Dress. 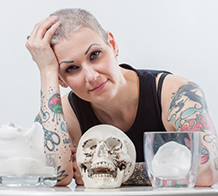 She does amazing work and her book and overall beliefs instill in me a sense of fun, individuality and daring. This design is titled Black Rose. 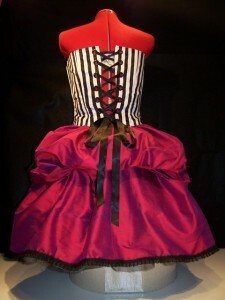 The “dress” actually consists of a corset, underskirt and overskirt. 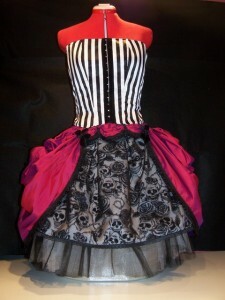 The corset is made from a heavy black and white striped satin, is fully lined and contains coiled steel boning. It laces up the back with grommets and black satin ribbon. I am very skilled at corset/bustier creation and would be most interested in more custom work in this area, especially for you curvier gals out there! The under skirt was created from a thrift store find – a full black taffeta skirt,which I shortened and made fuller and more “rustley” (that sound is so feminine and betwitching to me!) with layered tulle underneath. 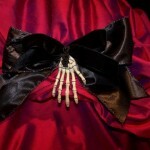 A panel of sheer black velvet skull and roses glitter fabric over white fabric was then placed on top of the center front of the black skirt. The last layer, the over skirt, is also a thrift store find – a floor length, shocking pink, silk ball skirt. The ball skirt has been made shorter by using ruching, pick ups and a bustle in the back. Silk is one of my favourite fabrics to work with. It is luxurious, comes in different textures and hands, is a dream to sew and the myriad of available colours is endless. 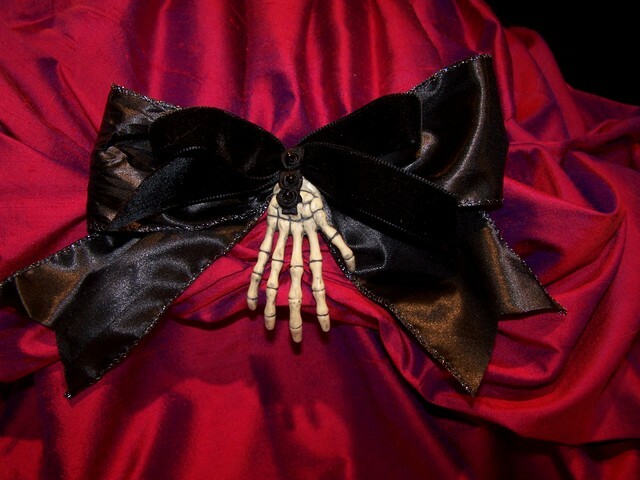 Embellishments in the skirts include the addition of black lace to the skull and roses panel hemline, black lace and organza trim to the entire hemline of the pink silk skirt, black velvet ribbon bows and ribbon roses, black beading, black satin bows at the side of the silk skirt and skeleton hands “holding up” the side pick ups on the silk skirt. This outfit was very satisfying for me to make as it incorporated the best of both worlds – making a new garment from the ground up (the corset) and combining it with two upcycled garments (the two skirts). I can’t wait to wear it to the party this Saturday night (Jan 21st) and see what kind of response I get. Positive or negative, I will feel like the belle of the ball that night and will enjoy every minute of the evening. Well, at least until the clock strikes midnight. Oh well, on to the next event/project then!